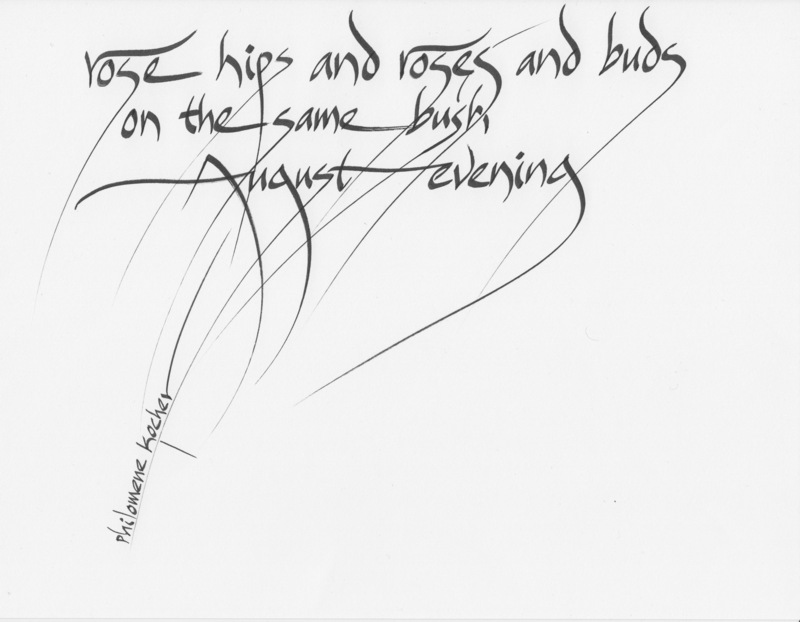 Philomene Kocher’s haiku/ H. Masud Taj calligraphy! Just look at this calligraphy! Every once in a while someone will make an offer you can’t refuse… In this case poet/calligrapher/architect/professor (and more) Taj emailed that if I would send him a haiku from one of my haiku authors, he would rewrite it in calligraphy to put on my blog. I sent this one to him because another of her publishers, Marco Fraticelli, said it was one of his favourite haiku, and I think it is deserves to be portrayed through Taj’s art. .
Taj and Bruce Meyer co-authored Alphabestiary: A Poetry-Emblem Book (2011, Exile Editions). Taj will probably say that this post was not supposed to be about him, so I won’t go on about his careers and publishing history, all of which you can discover yourself on the internet. (Actually Taj, I would like to do this myself on the blog one day…) I will only say further that when he is able to join one of our Ottawa poetry critique groups in Ottawa, (he is often away in India and other far Eastern places…) we learn a lot from what he sees in a poem. Philomene Kocher is another poet who will seldom get up on a podium to say much about herself, but she is a sensitive writer who is concerned about writing good haiku, and works to introduce others to this form of poetry. She has spoken at conferences, and worked with seniors who have lost great chunks of their memory, finding new inroads to their minds through haiku, while helping them to express themselves through the form. Her poem is the perfect one to be highlighted today. The calligraphy adds new dimensions to her observation about the rose bush, making us want to linger even longer with her words. Thank you Taj! Thank you Philomene!